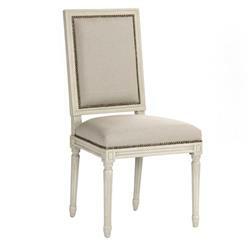 The antique finish on this pair of stately dining chairs gives them a stately authority. With a straight, rectangular back and exquisitely detailed spindle legs, the St. Germain side chairs will add elegance to your French country dining room or Hollywood regency home. Item sold as a pair.